A Dust Cap (or Containment Cap) is a silicone cap which snaps onto a metal collar that has been made a part of a chute, vessel or process. It is typically used to transfer a powder from point "A" to point "B" with full containment of dust during the transfer. Typically, either the discharge point or the receiving point is portable. The dust cap is normally made a part of the receiving point. 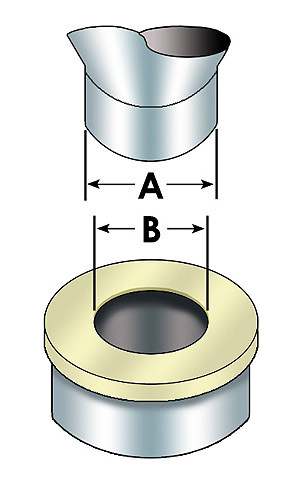 An undersized hole is cut in the cap to mate with a metal spigot, which is part of the discharge point. When mated with the undersized hole, the silicone dust cap provides a tight friction fit between the two points. This results in full dust containment when product is permitted to flow from one vessel to the other. 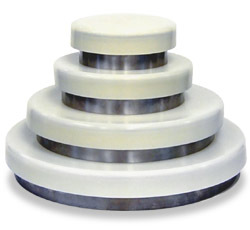 If a scale system is included on either side, the dust cap can also provide the necessary flex connection for accurate weighing. The caps are available in four (4) standard metric sizes: 120mm, 170mm, 250mm and 315mm; however, some custom diameters are available. All of our Dust Caps are manufactured in the US from FDA accepted silicone rubber and are "natural white" in color. Dust Caps can be custom made with other elastomers to try and meet any chemical compatibility requirements that you might have. Our containment collars are fabricated from 316 stainless steel and are available in either a standard or sanitary configuration. The standard collar has a slitted opening around the entire periphery of the rolled bead ring at the top of the collar. In the sanitary design, this slit is welded over providing a completely sealed and easily cleaned profile. 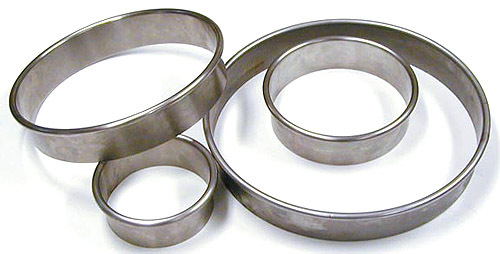 The standard collar is 50 mm tall for welding to a chute or vessel. Customized lengths and/or transitions can be provided to meet your specific needs. The successful use of a Dust Cap is as good as its fit with the spigot it mates to. If the hole cut in the dust cap is not perfectly round, is oversized, or its edges are not smooth, it will not seal. If it is undersized, it may wear prematurely. 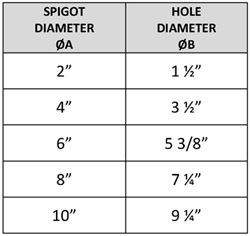 To optimize performance the hole must be cut properly. This tool allows you to cut the holes in the dust caps to the diameter for an optimum fit. Providing you with optimum dust containment.